Q: What type of product excites the door hardware industry? A: Next generation keychains! Despite sounding like a joke, a product capturing buzz on the showfloor at the recent ALOA Locksmith show was the 'Keyport Slide', a mechanical case that stores keys. In this note, we examine this product, detail pricing, and consider its value. 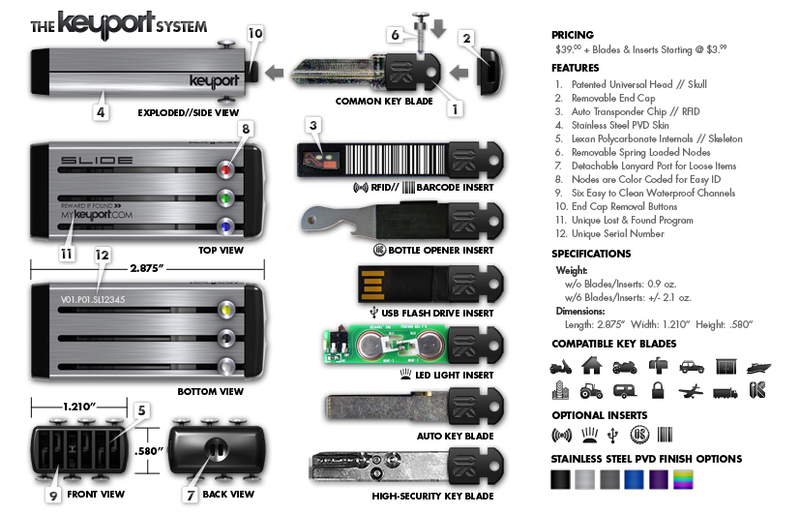 With Keyport Slide, up to 6 keys are stored in a retractable hard case. The advantage to this device instead of a keyring is that keys are protected against wear, and protect the carrier against injury. The 6 slding slots are configurable to carry either keys, or specialized accessories, like LED lights, bottle openers, or USB flash memory drives. Additionally, each keyport is serialized at the factory, enabling a basic form of key management that tracks who carries a particular unit. Keyport provides a 'lost and found' service hosted on the company website. Pricing: The Keyport base sells for $39 USD, and blade inserts cost between $4 and $34 depending on type. While the Keyport does not fundamentally offer new features, it does provide a unique way to keep track and store items commonly hung from a keyring. The durable finish, protective case, and serial number do provide limited advantages compared to unsecured keyrings, but the primary incentive of purchasing the unit is 'cool factor' and not 'security enhancement'. Commerical security users may find value in using Keyport to secure keys for small keying systems instead of loose keyrings. However, the limitation of only six blades could limit utility to very small systems. Access control systems are not fully supported, as the Keyport does not support credentials beyond barcodes and RFID tags. This means those items will still be seperately carried. Customers may find the process of having keyblades cut to be a hassle compared to on-site duplication/replicators found at hardware stores. In order to have a Blade cut, the customer must submit pictures of the front/back of an existing bitted key and upload the image to Keyport. This allow Keyport to send 'blanks' of the proper keyways back to the customer who can then have them cut at a locksmith. This additional step adds days to a duplication process that otherwise normally takes a few minutes. Another online review decribes this process, and the potential difficulties that may arise, in depth. We spoke to several Locksmiths who think the Keyport Slide is novel for consumers and small commercial users, but falls short of providing value to other markets. Assembling a handful of 'important' keys in a serialized Keyport Slide and checking it in/out to assigned users may improve key security procedures in smaller organizations. Being able to carry several 'submaster' keys in a 'grand masterless' keying system in a single device is an advantage, but there is nothing that prevents an end user for creating a special, serialized 'keyring' either.